The official trailer for director Jon Favreau's "live-action" adaptation of Disney Animation Studios 1994 classic, The Lion King, is here and...can we just talk about how fantastic the music is for a second? Hans Zimmer may now be known as Christopher Nolan's composer of choice the man has had a long history of producing movie scores and the original The Lion King is among some of his best work and that really shines here. While it's easy to be cynical about what are more or less re-makes of your childhood favorites in favor of modern technologies such as motion capture and some downright astonishing CGI over the classic hand-drawn style of animation that mine and so many generations before me were raised on it's also hard to deny the beauty and scope of what Favreau has seemingly been able to accomplish here. As with the filmmaker’s The Jungle Book, Favreau's take on The Lion King will feature a mix of CGI and live-action techniques; the tangible environments only making the CGI, but wholly convincing animals all the more real. The moment that music breaks in though, I dare anyone born between 1985 and 2000 to try and not be won over by what this movie might potentially bring to the table as the majesty and wonder these songs capture along with the pure spectacle these visuals provide will seemingly give audiences plenty to chew on even if the narrative is known. Also of note is the fact Elton John returned to re-record some of his original music for this updated version collaborating with cast member, Beyonce Knowles Carter, in the process; it seems as if the Rocketman will be having quite the summer. 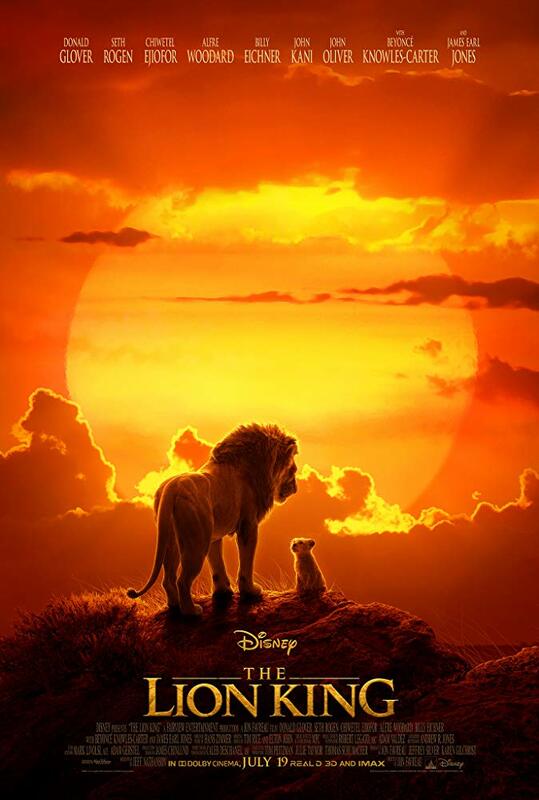 The Lion King will also feature the voice work of Donald Glover, Seth Rogen, Eric Andre, Billy Eichner, Alfre Woodard, James Earl Jones, John Oliver, Keegan-Michael Key, Chiwetel Ejiofor, John Kani, and opens on July 19th, 2019. Synopsis: Disney’s “The Lion King, directed by Jon Favreau (“The Jungle Book”), journeys to the African savanna where a future king is born. Simba idolizes his father, King Mufasa, and takes to heart his own royal destiny. But not everyone in the kingdom celebrates the new cub’s arrival. Scar, Mufasa’s brother—and former heir to the throne—has plans of his own. The battle for Pride Rock is ravaged with betrayal, tragedy and drama, ultimately resulting in Simba’s exile. With help from a curious pair of newfound friends, Simba will have to figure out how to grow up and take back what is rightfully his.